Capture internal search stats. This is a newer feature of Google Analytics and a very nice one. Not only can you see what a visitor put into your internal search box, but what page they were on when they made the search and what page they chose in the search results. Any internal search will work as long as it passes the search variable through the URL. Here’s a short video interview with Google’s Brett Crosby on some of those features. Filter out domains. Let’s say your Google Analytics code somehow got on another site and your stats were getting tainted with irrelevant data. No problem. You can create a filter to not count anyone from specific domains you add in. Oddly enough, you can also filter out your own domain so your stats flat line. Not a good idea to do that though. Export to Excel. For any newbies, this is a time saving feature. Just about any report can have the data exported to a CSV file which Excel can open. You can now stop copying and pasting most data out of Google Analytics and into Excel and save yourself some time. Filter yourself out. This feature is a must do for any company. Find your static IP address and then set up a filter so Google knows not to include traffic from your company network. This ensures that your stats are not inflated due to employee’s surfing habits. This also is something you should consider for any partner companies. If you have a web development, or SEO company who is constantly checking out the site, filter them out too. Those are just a few of the features that I’ve used and haven’t seen too much written about. If you have some unique Google Analytics tips, please do share. I forgot that they added the internal site search feature. I am going to have to set that up because that is some VERY important data that can help you find new terms to target. Thanks for the info! I have been using all of the tools mentioned above and I am really getting some added value from GA. Great post for people who aren’t maximizing their GA value. Thomas – For larger sites the internal search capture is huge. Thanks for pointing these out. I always say that to be a good web marketer you should learn and understand everything what Google provide. For tracking downloads I strongly advise to use their new tracker as it allows for much more customization as to what exactly is being clicked. Thanks about the site search suggestion, I had no idea. Just added that to a site I run that gets 700K page views per month, will be interesting to compare that to our internal tracker. It’s great that Thomas has highlighted some of the Google Analytics features that aren’t being used that often. I encounter a lot of scenarios where users ‘set and forget’ and never get the full potential out of Google Analytics. Here are a couple of posts I have written about Site Search within Google Analytics. The “Track document downloads or specific links” part is a pain. You have to insert the code into the HTML link of every file, and customize the code to reflect the file or else you’ll never know what specific file was downloaded. Come on, vogue! I would really like to hear about “features” that give us the actual query strings that trigger adwords keywords and the full urls of referring urls. Has anyone else notices that the hacks that used to work to do this no longer work. Why doesn’t Google provide this info that is certainly trackable, useful and could save us all a ton of money by identifying keyword searches that we do not want and can block with negative keywords. Its really nice to know if someone downloads a pdf. but I would rather know what “expanded” matched query string brought in a visitor that bounced the minute he hit my site. I am not too sure whether this is desirable for the clients. Aren’t people worried about their search data being minutely analysed? Its great feature of Analytics that i just found out. Thanks a lot. For sure track specific links is worth to try. I always want to know, which link that visitor visit more. Now i found way to find it. I wonder if the search tracker feature requires Google site search to work? OptimisedMedia – Nope. you can use it with any built in search like WordPress’ for example. Along the lines of “Track Document Downloads” is tracking when people subscribe to an email newsletter hosted by a email service provider. Since I’ve discovered that many ezine subscribers later convert to paying customers, I find this to be very helpful. The query string hack still works, but you have to pass it into the user defined value. ROI Revolution wrote about it a while back, it was brought up more recently on Semviroment.com’s blog. Check it out – Note you have to break down campaign data type by user defined variable. Thanks for pointing out the site search function. I use the other tools that you mention and they’re all really valuable tools for online marketers. filter feature is the best. that way you know for sure that google analytics is not taking your visitation as a visitor. Thanks for this info. I have been trying to figure out google analytics on my own. This sure will speed up my process. But I like how detailed their analysis is. I too, had forgotten about the Internal Search feature, but I’ve also got my GA account set up to email me a CSV every week, so I can combine it with my own analytics reporting stuff. Bloody brilliant, I tells ya, and I still can’t believe it’s all FREE. Crazy. Has anyone tried Google’s Site Overlay feature? I really love it. As an affiliate marketer, it’s really useful to see what links on my site, a visitor is clicking on. Actually your second feature can be useful in finding duplicate content from other domains. I have a separate profile where my main domain is filtered out. All domains showing up there are possible copyright infringement and duplicate content. With the overlay feature, Google analysitcs will take you right to your site and then hilite any link and tell you how many times any link withing the page has been clicked. You can see your site live, at that moment. You don’t have to look at a report or add linking code to any links as long as you have the Google analytics code already added to your website pages. Correct me if I’m wrong, but if I have two contact links on my site, on at the top and one at the bottom, Google’s overlay functionally will not separate the two. Instead they will have the same number of click and data. I just tested your theory out by doing a test and you’re absolutely correct. I don’t think Google makes this obvious enough and I really wish they’d find a way to track each link individually. That’d be more valuable. Doesn’t ClickTracks do this? Or possibly CrazyEgg? The issue with filters no longer working, and having to use the “user defined” variable are being addressed by Google. Many advanced custom filters stopped working on January 15th, and Google will be reprocessing the data to fix these issues. Expect the reprocessing to take about two weeks after the fix is implemented. Great post, I would recommend setting up a test profile to try some of these features out. Also, hold your breath for some of the new features that will be coming out in the next couple of months. They are stellar. Ok, I’m a bit of a laggard – But I got to having conversations on Blogging with Matt Bradley of SnapBomb and we were talking about Google Analytics – that conversation coupled with this article have fired up my mind on how to use Goog Analytics to measure skunkworks web site traffic and “how to tips” blogs to drive traffic to said skunkworks website to to build a database and analyze the traffic. Thanks Thomas for your civil service. a lot of junk and skewing the stats. And, the pricing is right, too. I’ve been trying to integrate GA E-commerce tracking with Paypal for a few weeks now. There doesn’t seem to be a lot of info out there on the subject. After a few weeks and a few hundred dollars, I’ve come up with a script that fully integrates Paypal with GA E-commerce. I’ve wrote a free ebook that includes the script you’ll need at no cost. There is nothing for sell here. I just wanted to see this info more widely available. You can get the ebook from this link. 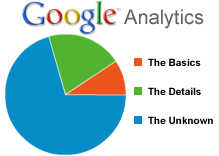 I don’t use all the features in Google analytics, but never the less it’s good to read about them. Hey all … I have a question and i really wish someone can answer me … I’m working on a website that has only one page, but it has many DIV’s in it … can i add google analytic to each DIV separately ?? Question: if you use js to track specific link won’t it appear twice in your report? That might be an issue, isn’t? And if that’s the case, do you have a handy solution to avoid that? Hi Svetlana Google doesn’t track which links are clicked on so they are not going to be counting anything twice. Google is more concerned with what pages people go to and how they navigate around the site. I also wrote an article about Google Analytics tips. It’s called Google Analytics Tips and Tricks. Please, take a look. The one I forgot to do was filter out my own IP. Just doing it now.